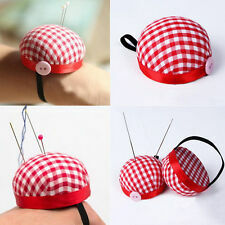 1 x Sewing Pin Cushion. Style: Random. Color: Random. Size: Approx. Convenient to use. El 30-mar-19 a las 18:57:04 H.Esp, el vendedor añadió los siguientes datos. 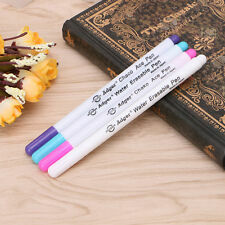 4Pcs/Set x Water Erasable Pen. These pens work great for quilting, embroidery, dressmaking or other projects where you need to mark fabric but don't want to leave a permanent mark. Also note that monitor settings may vary from computer to computer and may distort actual colors. Decoration: Button. Material:Cloth and Foam. Product Name : Calabash Safety Pins Material : Metal Color : Gold Size : 21 x 9mm / 0.8" x 0. Usage: thin, perfect for patchwork and other common DIY projects. Material: Cloth and Foam. Usage: thin, perfect for patchwork and other common DIY projects. Designs and colors: mixed at random. Usage: thin, perfect for patchwork and other common DIY projects. Quantity: 1pc(Random Color). Size (D x H): About 60 x 30mm. Designs and colors: mixed at random. DIY needle lovers prerequisite products. With quality foam and cloth, the needle will not hurt your hand. Wrist Band Width: About 6mm. Color: as picture(Random). Material: Cloth and Foam. Soft chalk for optimal light application. Red, yellow, blue, white. However, we will try our best to minimize it. make you happy. We are very fair and easy to deal with! If you are unhappy. Size: 55X20 mm. DIY needle lovers prerequisite products. With quality foam and cloth, the needle will not hurt your hand. Under the influence of light and the display, the color difference may decrease slightly. Safe foam filler, light weight that you can bring it wherever you go. 1Set(10Pcs)xTailor's Chalk. Quantity:1Set(10Pcs). Also note that monitor settings may vary from computer to computer and may distort actual colors. Have gasification,after 72 hours,Scratches disappeared without a trace,it surface is specially coating and tack free,Harmless to human body. DIY needle lovers prerequisite products. With quality foam and cloth, the needle will not hurt your hand. Wrist Band Width: About 6mm. Material: Cloth and Foam. Tailoring chalk, hand necessary tools, crossed soft, clear, leaving no scratches after clothing fabrics. Advanced color chalk, transparent plastic small box, easy storing. Color: Multi-color random. Tailoring chalk, hand necessary tools, crossed soft, clear, leaving no scratches after clothing fabrics. Material: Chalk. The color may have different as the difference display,pls understand. Color: white,orange,yellow,blue. Erasable Fabric Pen gives you precise smooth lines, which disappear like magic over air. Erasable Pen only, other accessories demo in the picture is not included. 2 x Air Erasable Pens (Hot Pink,Purple). 1 x Pin Cushion. Shape: Tomato. Keep pins with you; Handy size for sewing basket. Cuscino dell'ago conveniente per il vostro lavoro di cucito fai da te. 1 x cuscino dell'ago (gli aghi non sono inclusi). Quantità: 1pc. Suitable for sewing, embroidery, quilting, needlework, etc. Lovely hedgehog-shaped needle cushion with hook design, beautiful and easy to carry. Item Type: Sewing Pin Cushion. 1 Sewing Pin Cushion. 1 x Sewing Pin Cushion. Material: wood. Due to the light and screen difference, the item's color may be slightly different from the pictures. Small in size. Height: 3.5CM/1.38in. Quantity: 1pc. Usage: thin, perfect for patchwork and other common DIY projects. Material: Cloth,Foam,Wooden bottom. Size (D x H): About 72 x 35mm. Usage: thin, perfect for patchwork and other common DIY projects. Quantity1pc(Random Color). 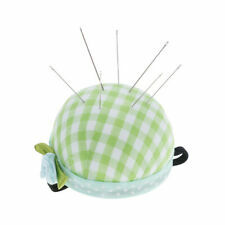 1 Piece Magnetic Pincushion. - Easy to hold in your hand or rest beside your sewing machine.